As you read this article, CASE and CEC are hosting our legislative summit in Alexandria, VA. CASE has been hosting a legislative meeting which includes "storming the Hill" for 15 years. For the last three, CASE has been joined by CEC. What an amazing coming together for the good of children! We have to have one voice, especially during these times of attacks on public education. We have 43 of the 50 states represented in the 250 participants! We hope next year to have someone from every state! Why not start thinking now about a family vacation to DC — everyone should go to DC! We always are in a great hotel/location and why not combine work with pleasure! The dates for next year at July 8-11, 2018! But for now, we continue to need you action with your congressional delegation! Make it a habit to visit CEC's Legislative Action Center. It is not too late to let your Senators know how you feel about the healthcare issues! It doesn't hurt to visit their websites and send your opposition form there. Call their offices — local and DC — and let them know. The key here is multiple contacts on multiple days by as many of your friends, family, and colleagues as possible! We apologize! Our registration site was down off and on last week! But we have extended Early Bird Registration to give you all a chance to get registered at the lowest price offered! Kindel Mason (ID), CASE Professional Development chair and his committee have put together an amazing program! 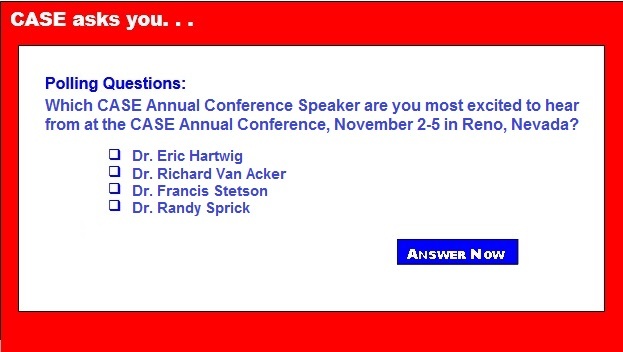 The 27th Annual CASE Fall Conference will be held at the Nugget in Reno, NV, November 2-4, 2017. Now is a great time to go ahead and reserve your room at the Nugget at the amazing group rate of just $81 a night — and that includes your airport to hotel and back transportation! We are working on registration and hope to have it up in the next month. In case you are a part of the your State/Provincial leadership — the CASE Board of Directors will be meeting all day on Wednesday, November 1 and the morning before the conference starts at lunch on November 2! Mark your calendars! The question last week was an open-ended question ... "The terms dyslexia, dysgraphia, and dyscalculia ..." The number one answer at 38 percent was "causes a great deal of stress with parents". Second place was at 23 percent was "causes some of my colleagues a great deal of stress". There was a tie for third place at 15 percent between was "not an issue in my district/state/province" and "other". Other was explained as an issue that was being worked on but even with all the work one poor response from a teacher sets the process back. Higher education needs to be more responsive to teaching all teachers to teach reading and to understand dyslexia, moderate confusion, moderate stress, etc. Coming in last at 8 percent was "causes me a great deal of stress." We hope the SLD discussion starter will provide everyone with needed resources. As a reminder, the purpose of this document was to provide a communication bridge for parents and school personnel as it relates to the terms dyslexia, dyscalculia, and dysgraphia. A team of representatives from 12 national organizations representing parents, special education, school psychologists, directors of special education, and state directors of special education were brought to Washington, DC, in October 2016 to begin the discussion. Let us know how you are able to use it! Thank you once again for making a difference in our school, with our families and most certainly with students with disabilities. One of the most common disciplinary actions that occurs in schools is suspension. Suspension has been a consequence for misbehavior since the inception of formal education. In the past, loss of the privilege to attend school was viewed as a harsh punishment because education was valued so highly. Although the roles of schools in society have changed and evolved, and the population of students that public education serves has become more diverse, suspension remains the primary disciplinary consequence employed in schools. Despite its emphasis, researchers have demonstrated that it is not serving the intended purpose of changing problematic student behavior and is leading to a host of detrimental student outcomes.